This model presents a means by which we can quantitatively measure the inner membrane potential of the mitochondria by using the membrane potential sensitive dye rhodamine-123 (R123) in order to estimate transients in mitochondrial membrane potential from kinetic measurements of fluorescence intensity. Use of such dyes are used to make noninvasive dynamic measurements of mitochondrial membrane potential (∆Ψ), a key indicator of mitochondrial energetics, in both in vitroand in vivo systems. This model was developed to quantitatively analyze the kinetics of the mitochondrial inner membrane potential. It accounts for dye transport, including electrogenic transport across the mitochondrial inner membrane and partition into the membrane, as well as experimentally measured dye self-quenching, and was integrated into a previously developed model of mitochondrial electrophysiology in order to estimate transients in mitochondrial membrane potential from kinetic measurements of fluorescence intensity. In the figure 1 to the right the relationship between fluorescence and concentration of R123 in aqueous solution is graphed. Normalized fluorescence intensity is plotted against R123 concentration in the absence of mitochondria. 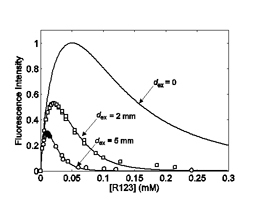 Open circles correspond to data collected using a 10×10 mm cuvette, with mean excitation and emission path lengths of dex= 5 mm and dem= 5 mm; squares correspond to data collected using a 4×10 mm cuvette, with mean excitation and emission path lengths of dex= 2 mm and dem= 5 mm. Solid curves represent fits to Equations (1) – (3), which correct for the ob-served inner filter effect. The curve indicated for d= 0 is the prediction of Equation (3), with parameter valuesk0= 8.15×104 M-1, k1= 5.16×104 M-1, k2= 1.01×106 M-2, and k3= 3.909×1012M-3. Aqueous solution is identical to that used for mitochondrial respiration buffer with the exception that R123 concentration is varied. Figure 2 demonstrates the comparison of model predicted and experimentally measured fluorescence time courses for state-2, -3, and -4 respiration. (A.) Fluorescence measurement on suspensions of isolated mitochondria (gray circles) overlaid with model prediction (solid black line). Mitochondria isolated from guinea pig heart (described in Methods) was added at time 0 to the cuvette containing respiration buffer with R123 and pyruvate substrate. Accumulation and quenching of dye inside the matrix cause a drop of fluorescence signal of over 50%. Addition of ADP results in transient and reversible activation of respiration as well as transient depolarization of the mitochondrial membrane potential. CCCP was added at the end of the experiment to collapse the membrane potential as a positive control for ∆Ψ = 0. (B.) 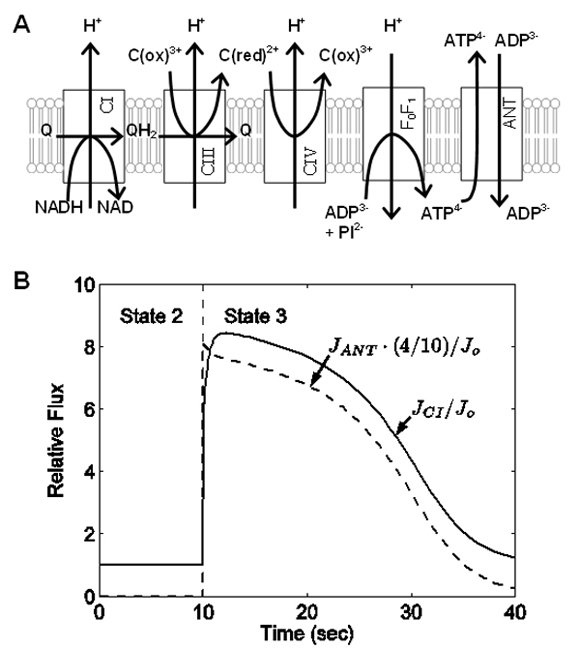 A detailed view of the ADP-induced transient depolarization of the mitochondrial membrane potential is plotted. In addition to the measured and model-predicted fluorescence intensity, the model-predicted ∆Ψ is plotted. Model predictions was obtained for p= 5.869 moles(liter mitochondrial volume)-1 sec-1 M-1, α=4.727, and β= 0.3799. Figure 4 shows mitochondrial inner membrane electrophysiology. (A.) Components of the electron transport chain, F0F1-ATPase, and adenine nucleotide translocase (ANT), which carry current across the inner membrane, are illustrated. (B.) Time course of predicted fluxes through the respiratory chain and ANT are plotted for the transition from state-2 to state-3 respiration. Fluxes are normalized to Jo, the state-2 flux through complex I. Simulation is for a mitochondrial concentration of 0.5 mg protein ml-1. State 3 respiration is simulated by adding 0.25 mM ADP to the buffer at time 10 seconds. Huang M, Camara A, Stowe D, Qi F, Beard DA. 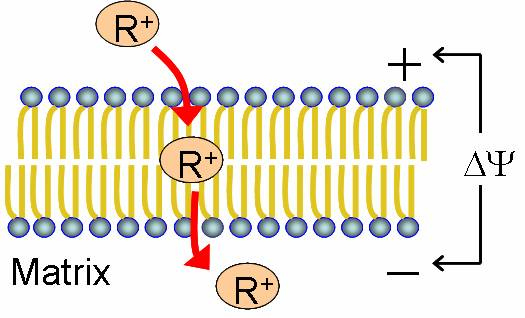 Mitochondrial Inner Membrane Electrophysiology Assessed by Rhodamine-123 Transport and Fluorescence. Annals of Biomedical Engineering. 35: 1276- 1285, 2007.